Despite Samsung launching a new wave of Gear S3 smartwatches at IFA 2016, it's fair to say that the smartwatch revolution has got off to a slow start. 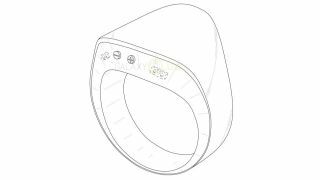 But watches might not be the only wearable at the end of Samsung's sleeves – a new patent suggests the company is taking smart rings seriously too. A patent filed by the company (spotted by Galaxyclub.nl) shows a tech-filled loop worn on the finger by its user, complete with buttons and sensors, presumably to control other connected devices. Plus and minus buttons on the ring point towards media volume controls, while a set of dots on the underside could indicate some sort of fitness monitoring functions, such as a heart rate sensor. As a patent showing a specific design, rather than concept functions, it's clearly an area that Samsung's keeping a keen eye on. A patent is never a guarantee of a final product, but it's worth exploring what Samsung could be planning for such a device. Could the smart ring be used to control Samsung's nascent Gear VR virtual reality experiences? As a mobile VR viewer, obscuring peripheral vision, a low-profile controller for use on the go could be useful. Samsung's SmartThings IoT home automation hub could be a potential pairing, too. Potential fitness functions aside however, it's hard to see why anyone would use a smart ring merely for smartphone control. Though there's not much competition out there, existing smart rings have hardly set the world on fire. The Mota Kickstarter never got off the ground and the Ring, when it eventually materialised, barely worked at all.